Big, small, tall or short…it’s no secret that women tend to be hyper critical when it comes to how they look, an unfortunate phenomenon that only becomes more acute as temperatures heat up. It doesn’t help that we’re bombarded with news of celebrities surviving on baby food and committing to unrealistically strenuous workout routines. Every so often, however, a refreshing voice comes along to remind us that fashion is meant to be enjoyed and our bodies — no matter their size or shape — are meant to be appreciated. One such influencer is style expert Marcy Guevara who, having dressed Michelle Buteau and Gabourey Sidibe among many others, is one of the biggest names in plus-size styling. She has also appeared on the Rachael Ray Show, The Dr. Oz Show and Hallmark Channel’s Home & Family. 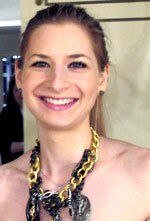 Here, she chats with us about dressing your curves and style philosophies to live by. 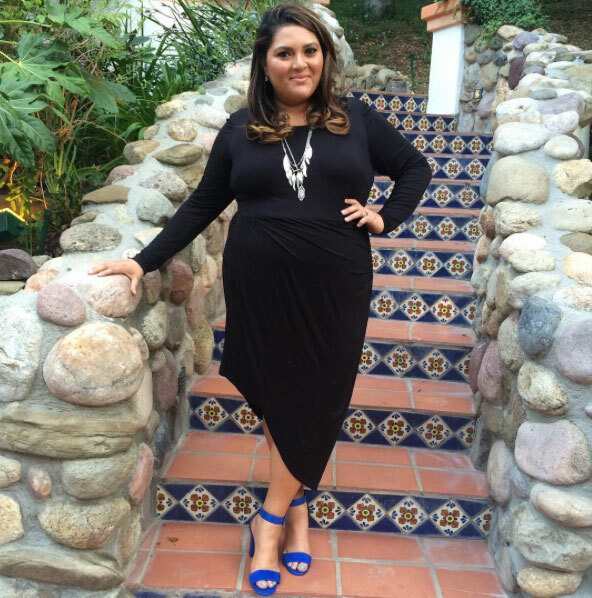 theFashionSpot: What are your favorite tips for dressing curves? Marcy Guevara: Break the rules! It sounds cliché, but too often we’ve got those old guidelines from grade school stuck in our heads. Don’t wear stripes! Don’t show your arms! Boo! Do what you want and embrace your shape. I love when people realize what works for them and what doesn’t versus following what you’re told to wear. The most important thing is to LOVE what you’re living in. Sometimes trends aren’t for you…that’s OK! tFS: Women of all sizes tend to feel self-conscious when it comes to shopping for swimwear. Any tips for feeling more confident at the beach? MG: Be thankful! It sounds silly to some, but being thankful is one of my go-to tips. Grateful that you can swim in the water, feel the sand in your toes, enjoy friendship while watching a sunset. Stop allowing your fat to hold you back and live! I love swimwear by BECCA ETC. It’s well-constructed and has really cute cover-ups to mix and match with it. Plus, pairing a great-fitting bathing suit with killer accessories gives me a confidence boost — I love a great simple pair of silver hoops and am really into tassels right now. Statement necklaces are still a must and I’m also a fan of wearing wedges when poolside. 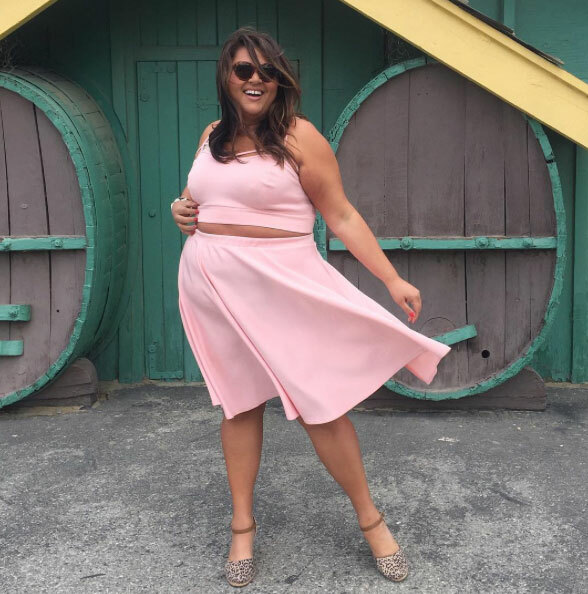 tFS: What’s the biggest mistake you think plus-size women make when getting dressed? MG: Thinking that they can’t do this and can only do that. Being limited by trends they feel that “work” for them and avoiding things they’ve been told they can’t pull off. It’s not the fringe or the stripe that you can’t wear, it’s about finding the right stripe. When it comes to finding what’s right for you, it’s important to experiment and play around. You won’t know what works unless you try it on! Whether that means you order things online and figure that out in the comfort of your own home or you do it in your favorite plus-size store, you won’t know what cuts work for you unless you dare to try something different. tFS: What are some closet essentials you think every plus-size woman should own? MG: They are really no different than what a straight-size woman should own. Generally, the things I consider essential are a great LBD, some comfortable shapewear you can wear with everything, fabulous riding boots and the perfect jean jacket. MG: I find inspiration everywhere! I love Instagram and seeing what other people are doing; @advancedstyle, @naturallyfashionable and @garnerstyle are some of my favorite accounts. I am also very inspired by the pieces that come through my shop The Plus Bus. We are a plus-size clothing store with the option to swap or shop and we are always in awe of the garments that our customers bring our way. tFS: Can you tell us about some of your favorite trends for this season? MG: I love the bright colors we’re seeing everywhere! Neons and brights are my fave and can’t help but give you a happy feeling when you wear them! I love pompoms on everything and the boho look that’s still big for summer. While festival fashion may be played out, dressing like a hippie isn’t! tFS: What’s the one thing you want all plus-size women to know? MG: LOVE YOUR BODY! LIFE IS SHORT!!!! IT’S NOT WORTH IT!